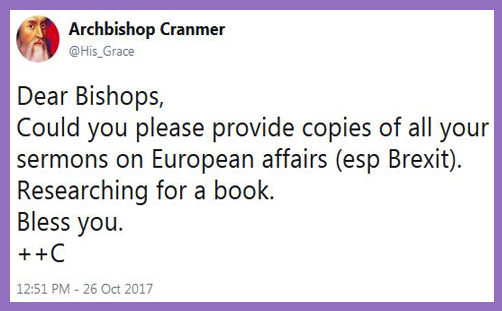 When it transpired that the reason Chris Heaton-Harris MP had written to all university vice-chancellors asking for the names of academics lecturing on Brexit was simply because he was writing a book, it seemed a reasonable stratagem to discover what our bishops have been preaching on the matter. So, with the dorsum of tongue firmly in cheek and wink in the eye (which some may call a plank), the tweet went out. And all the Bishop naturally ignored it. Arguably the busiest one of them all. Justin Welby was a devout Remainer. In his heart he may still be, of course, but he is certainly no Remoaner. “I accept we voted leave and I will be supporting the Brexit Bill in the House of Lords,” he told LBC earlier in the year. The people have decided that the UK is leaving the EU, and that, he avers, is precisely what we must now do. In response to the tweet, Lambeth Palace sent over six lectures and addresses where he touches on Brexit, and while there is a tinge of regret in his tone and an acute awareness of a myriad of complex questions to fathom, there is no doubt about his conversion. No, not conversion; that’s too much of a jolt. There’s no doubt about his resignation, yes, that’s the word. “I weighed it up very carefully at the time. Maybe I got it wrong, you might well be right, and If I did, I apologise,” he told Judith from Whitstable, who reportedly left the Church of England over the Archbishop’s (/s’) Remain fervour. To view the United Kingdom’s decision to leave the European Union as a raising of the drawbridge from all of our relationships with the European continent is something that none of us can afford. A vision for Europe must go beyond the boundaries of the European Union. …Whatever our perspectives on the rights or wrongs of the decision, the role of political leaders, from both sides of the English Channel, must be to ensure that both parties can thrive in the new reality and that the pursuit of the common good remains at the heart of the process. Others, on the remain side, are apocalyptic in their forecasts. They foresee the Four Horsemen of the Book of Revelation (death, hunger, war and conquest), or at the least the UK economy becoming like that of Greece, with massive rises in unemployment, a sharp fall in the value of the pound, consequent high inflation, the country turning in on itself and succumbing to extremism and xenophobia. They argue that the negotiators for the European Union, and after them the individual states and the European Parliament, have no incentive to negotiate a good deal for the UK, as although the UK is a trading partner of importance for the block, for each country it is less essential. They think that the Union will need to punish the UK to deter subsequent attempts to leave. They think the time for negotiation wildly inadequate and thus the chance of a hard Brexit high. They foresee years without good trade arrangements, a country ill prepared to stand on its own outside the European Union and little interest from those with whom we hope to trade. They forecast government utterly absorbed in negotiation and Parliament occupied for years in consequent legislation. If those wildly in favour sometimes seem to resemble Dr Pangloss, those most against risk giving the impression of channelling the depressed robot, Marvin, the Paranoid Android, in ‘The Hitchhiker’s Guide to the Galaxy’. ..Subsidiarity is challenging and frightening because it assumes that there will be failures, while claiming that local responsibilities, and local knowledge will be more important in resisting oppression, misjudgement and cruelty than central systems. The results are usually messy, often inefficient, but they give a deep sense of local responsibility to those who have to make things happen. They do not always prevent trouble, and in some areas they have failed, most seriously and most tragically in the prevention of the abuse of children and vulnerable adults. The Church of England – believe it or not – a model of subsidiarity. It is not based in a few people at the ‘top’, whatever that means (it is a concept disliked by Jesus to start with and most of the best leaders since) but on the 8,000 and more local parishes, chaplaincies, groups, who will continue doing what they do pretty well regardless of what happens or what is said at some self-imagined grand central level of decision making. But we are genuinely a picture of subsidiarity and God forbid that we should give up on it because it’s untidy. It is easy to make the case that power groups are what control our lives – and to some extent it’s underpinned the case made by those advocating Brexit, by the so-called populist movements across Europe, and by President Trump during his campaign in 2015-2016. Expressions such as ‘drain the swamp’ – referring to the lobbyist dominated political culture of Washington DC – and similar attacks on lobbying in Brussels and other EU centres, play on a suspicion that the system was rigged. Power and wealth and security could only be acquired by underhand means, by being in the loop and at the centre. There was no sense of justice, fairness and equal opportunity. And thus the Brexit campaign focussed, apart from immigration, on returning power to the UK. Curiously, he suggests that such a process of subsidiarity is “an illusion – to a large degree”, because “(t)he moment you think you’ve hit on the inner circle you discover there’s an even more inner-circle that you didn’t know about”. Yet he observed in his Paris lecture that it is certainly no illusion for the Greeks, who are victims of “collusion” having been sold a “false prospectus” through “corruption by an elite”. Why is the desire for currency sovereignty an “illusion”? This is a moment to reimagine Britain, a moment of potential opportunity, certainly combined with immensely hard work and heavy lifting. It is a moment of challenge, but challenge that as a nation can be overcome with the right practices, values, culture and spirit. This could be a time of liberation, of seizing and defining the future, or it could be one in which the present problems seize our national future and define us. ..We need a narrative that speaks to the world of bright hope and not mere optimism — let alone simple self-interest. That will enable us to play a powerful, hopeful and confident role in the world, resisting the turn inward that will leave us alone in the darkness, despairing and vulnerable. ..Such a vision has a deep magic that has, at our best, enabled us to be a country of hope and purpose — and will do so again. Was that a purposeful echo of Pitt the Younger – “England has saved herself by her exertions, and will, as I trust, save Europe by her example”? If not, it seems a sound allusion to finish on, for Justin Welby has evidently become an advocate of genuine European subsidiarity and a defender of hard Brexit, or clean Brexit, or pure Brexit, or real Brexit. Deo gratias.